Foreground, the excellent ATAR 9K-50 engine which so much proved its excellence on Mirage IVs that it was adopted for the Mirage F 1 fighter and, later, in its version 8K-50 deprived of reheat, for the Super-Etendard. Behind, Mirage III B C/n 201 belonging to CIFAS 328 ( Strategic Air Force Instruction Center ), the Bordeaux-Mérignac based unit specialised in the permanent navigation training and formation of Mirage IVs crews. 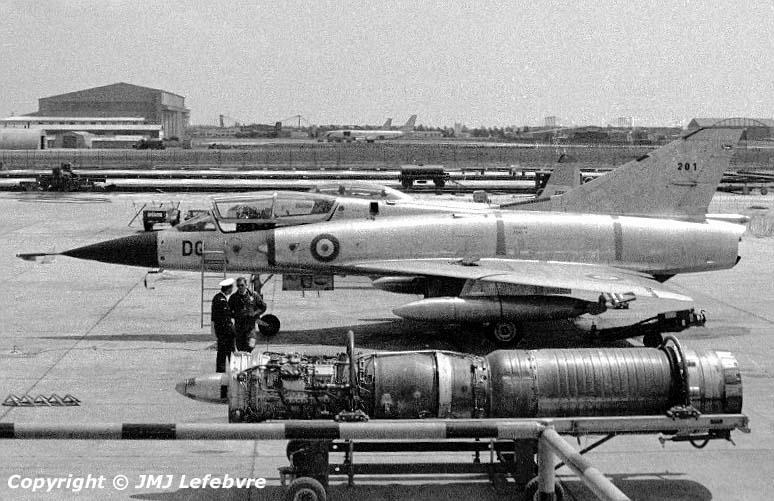 Aircraft coded DA to DF were different with their strong nose refuelling probe and known as Mirage III B-RV (Ravitaillement en Vol (Flight Refuelling) ). The unit totalled 4 Mirage IV As, 15 III Bs and B-RVs and 10 Nord 2501 SNB Noratlas, all ten being specially fitted with the same Navigation & Bombing System as the bomber, their noses being bulged with the Mirage IV A radar. Moreover twelve T-33s and an unknown number of Fouga Magisters were used by crew and other specialists for communications between Bordeaux and all FAS units in France.